If you’re currently in the market for a naked middleweight you’re spoilt for choice. Every manufacturer makes a budget bike aimed at this segment and because of this the range of machinery on offer is mind-boggling. Engines vary in their configuration from V-twin, parallel twin, inline four, single to triple. And to match this diversity of motor there is an equally wide ranging choice of wacky or conventional styling. There is a bike out there to suit anyone’s tastes, no matter how unique. As Kawasaki’s updated ER-6n hits the UK’s streets, we decided to concentrate on the twin cylinder middleweights. Yet even this has thrown up a huge diversity. While the ER-6n uses a parallel twin engine, the Ducati Monster 696 and the Suzuki Gladius are both V-twins. You may think these two twins will be alike, but nothing in this class is certain with the Ducati using an air-cooled motor containing two valves per cylinder and the Gladius a liquid-cooled one with a four-valve head. Since its launch in 2009, Suzuki’s Gladius has gently matured. Suzuki’s stylists have eased back on the garish colours and in its red and black paint scheme the Suzuki looks great, aggressive without being overly weird and yet still different enough to stand out. 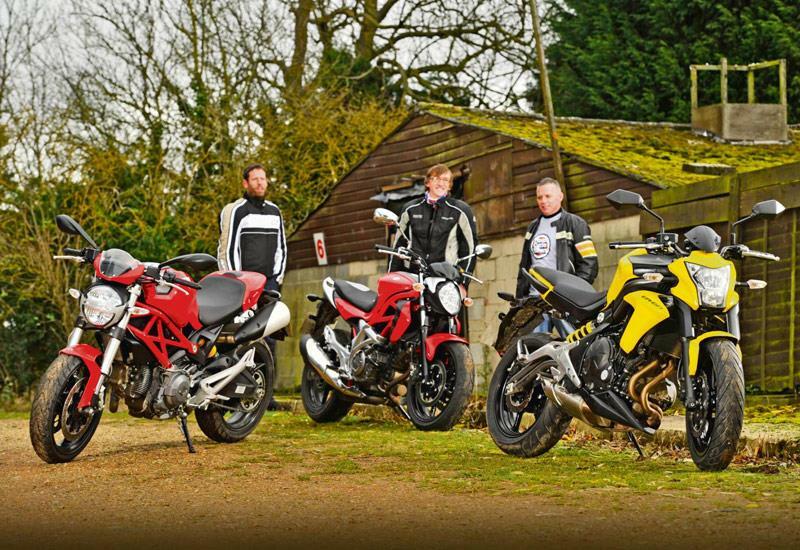 There is even a hint of the Brutale about the Gladius, which is no bad thing. Italy is, after all, renowned for its artistic flair, something that is reflected in the Monster 696. Finally we have the updated ER-6n, a bike that you feel has been designed by someone who understands the needs of newer riders. The changes to the 2012 bike aren’t instantly apparent, however when you notice that the large side panel, the first point to touch down in a low speed spill, no longer contains an expensive indicator and the seat height is reduced you start to appreciate the updates. Less cluttered instruments and a new look are small, yet significant, alterations to improve an already fresh looking and friendly to ride bike.